The U.S. men's national team drew Chile in a match that showed the current limitations of the squad during its work in progress under Gregg Berhalter and also cost the U.S. a second key midfielder in as many matches. The U.S. men's national team got just what it wanted vs. Chile. No, the 1-1 draw in Houston wasn't the desired result. The test provided by the Chileans offered more of a barometer for where the U.S. under Gregg Berhalter stands, though—more than previous wins over second-choice Panama and Costa Rica teams earlier in the year and an Ecuador side that didn't look all that interested in taking the onus to attack in their matchup last week. Unlike those matches, in which the U.S. averaged over 62% possession playing the type of soccer Berhalter is trying to instill, the U.S. was on its heels for much of the night vs. Chile, conceding two-thirds of the ball and failing to exert control over the match. And that, for learning and building purposes, was a welcome change of pace for the U.S. manager. "It's just the type of game that we need," Berhalter told ESPN at halftime. With no more games before pre-Gold Cup camp convenes in a couple of months, this was the last time Berhalter could gather his squad together, and, as he alluded to in his brief halftime remarks, he was eager to see his team challenged. It started off in a promising manner, with Christian Pulisic scoring four minutes in off a relatively routine, direct sequence. The lead was gone within five minutes, though, with Oscar Opazo the beneficiary of the USA's inability to clear its own area. In a lot of ways, this had the hallmarks of U.S. games of yore. The USA chasing its opponent, struggling under pressure, breaking forward on the counter and looking susceptible in the back; bending but not breaking. Gone was Berhalter's right back hybrid, with DeAndre Yedlin—whom Berhalter had said he viewed as more of an attacking winger— instead playing a more traditional role in defense. The U.S. didn't really resort to long-ball tactics and did try to play out of the back, but turning that into meaningful possession in the attack proved to be a challenge. The Americans never pummeled the zone outside the top of the box and lacked the ability to consistently deal with Chile's pressure and win the ball back when it was lost. Pulisic's goal was the only shot on target all night. It was foolish to expect the U.S. to have the same level of control as it had recently vs. experience-laden Chile—even a Chile side that isn't in its best way at the moment—but the hope surely was to see more signs of progress taking hold. Pulisic's 35th-minute injury didn't help matters, and the fact that there was heavy lineup rotation was also a contributing factor, but you can be sure Berhalter will be using the film of this match as a teaching tool for the tougher tests down the line. There's really one thing you want to avoid during friendlies, and that's a key injury. Bad results can be useful teaching tools and are of little true negative consequence, but not losing players—especially ones trying to grasp a new system for the first time—should be priority No. 1. So it's a huge blight on these two friendlies this window that both Pulisic and Weston McKennie were hurt and forced out of matches. McKennie's ankle injury, suffered against Ecuador, will sideline him for "several weeks," and it's unclear whether that means the Gold Cup is still in frame for him or if he won't be match fit by the time it rolls around. Pulisic's quad injury—U.S. Soccer deemed his substitution "precautionary"—appeared to be considerably less severe, but it's still the last thing Berhalter wanted to see, with playing time at a premium for him before this summer's competition. There's also the matter of the big picture. 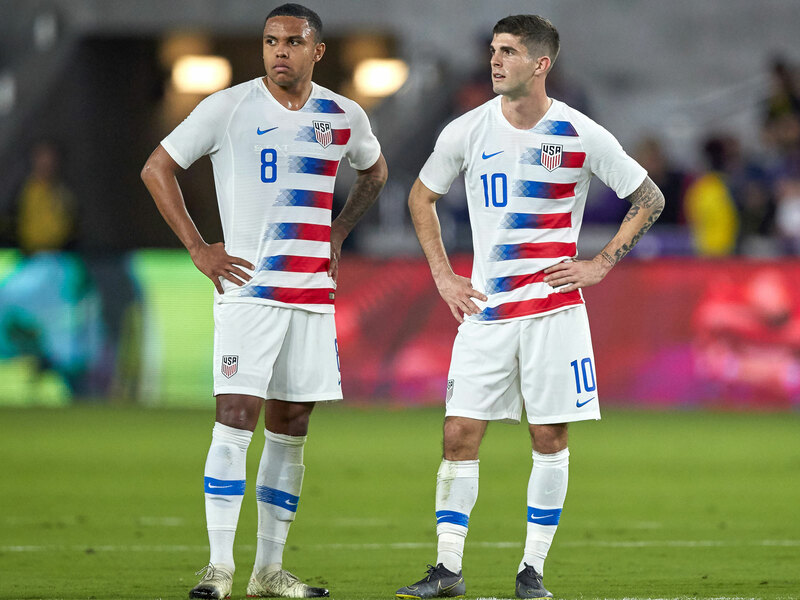 For 20-year-olds, Pulisic and McKennie are compiling quite a lengthy list of injury woes for both club and country. They're not necessarily of the severe variety, and they've shown the ability to bounce back from them repeatedly, but it's a long-term warning sign surrounding two key figures for both the present and future of the national team. Their participation going forward is paramount to the USA's success. Gyasi Zardes and Michael Bradley seem to draw the ire of U.S. Soccer fans for different reasons, but each fared pretty well vs. Chile. Zardes may have delivered the win last Thursday off a fluke opportunity vs. Ecuador, but there was nothing fluky about his set-up for the U.S. opener. Panned widely for his lack of a first touch, Zardes displayed a lovely touch to take down Ethan Horvath's long ball down the center of the field before turning and sending Pulisic on his way. Beyond that, Zardes was proactive, dipped into the playmaker's space at times and looked to push the issue when given the opportunity. He didn't put any chances on goal, which, as a starting striker, is the main objective, but he acted as more of an outlet Tuesday than he had in his previous matches and served a valuable role on the night. As for Bradley, he dropped two long passes into Corey Baird's path that both could have–and perhaps should have–resulted in goal-scoring plays in the first half. He did require help policing the middle of the field, with Chile overwhelming the USA in that area until a tactical switch brought more bodies into the midfield. But in terms of his distribution and overall play, it was another night that showed the call-ups will continue to come for the 31-year-old, no matter how loud grudge-holding fans will demand for the contrary. Bradley was 57/63 passing on the night (90%), covered a characteristically large amount of ground and came up with 18 recoveries with the U.S. under pressure for much of the game.